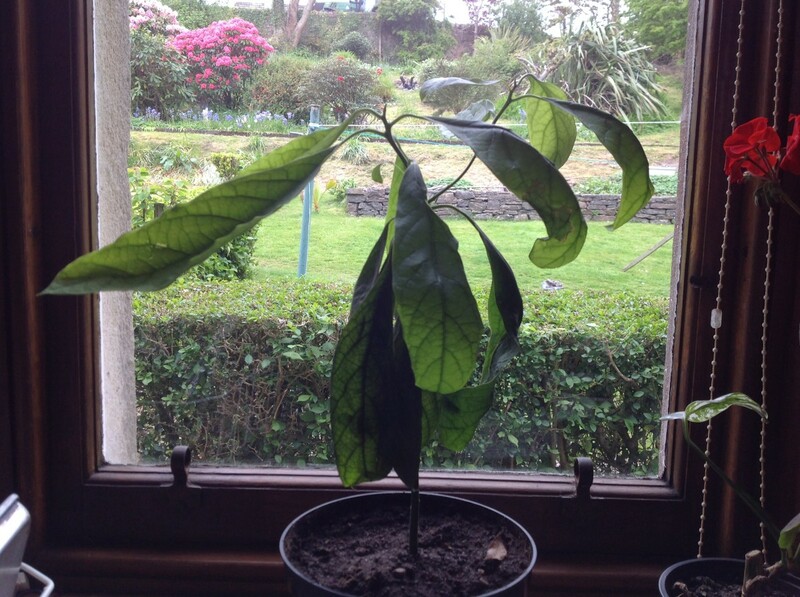 The growth of a tree depends on the prevailing soil and weather conditions. Getting to know the soil type and the conditions in which a tree will thrive help to choose the right tree for your hedge. Presenting a selection of fast growing hedge trees with details about the best conditions in which the tree will flourish and form a great hedge. Leyland Cypress is also known as Leylandii (Green). It is a fast growing hedge tree that grows up to 3 feet per year and can reach heights of 4 feet. 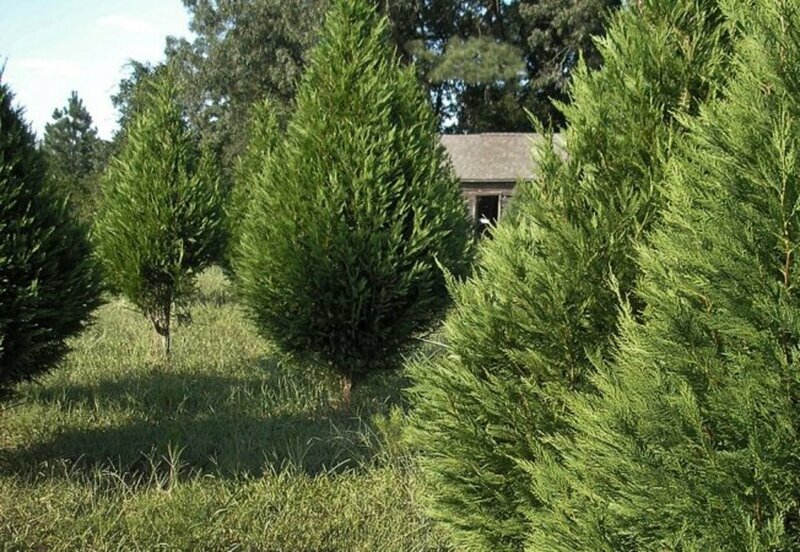 Leyland Cypress is an evergreen coniferous tree with dark green leaves. The leaves are dense and form a thick closely woven hedge that that provides privacy and filters out dust that blows with the wind. 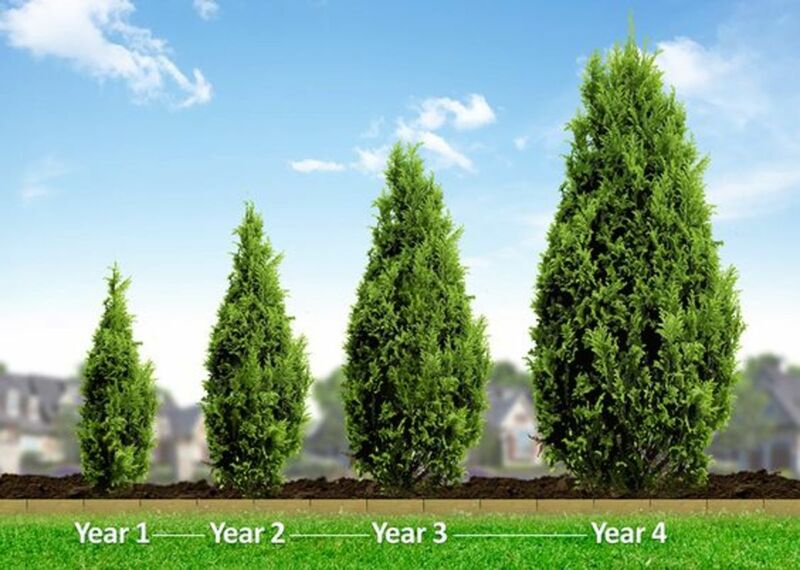 To maintain the Leyland Cypress trees as a hedge trim them three times a year, in late spring, summer and early autumn. If left untrimmed these trees can grow to over 100 feet tall. Leyland Cypress grows well in full sun to partial shade and flourishes in wet, heavy, clayey soil that is not waterlogged. Nellie R. Stevens Holly is a fast-growing evergreen tree. It is multi-stemmed and has a dense network of foliage. Nellie R. Stevens Holly is a hybrid of the Chinese Holly and the English Holly. This tree adds a pop of color to the hedge with its bright orange-red berries. 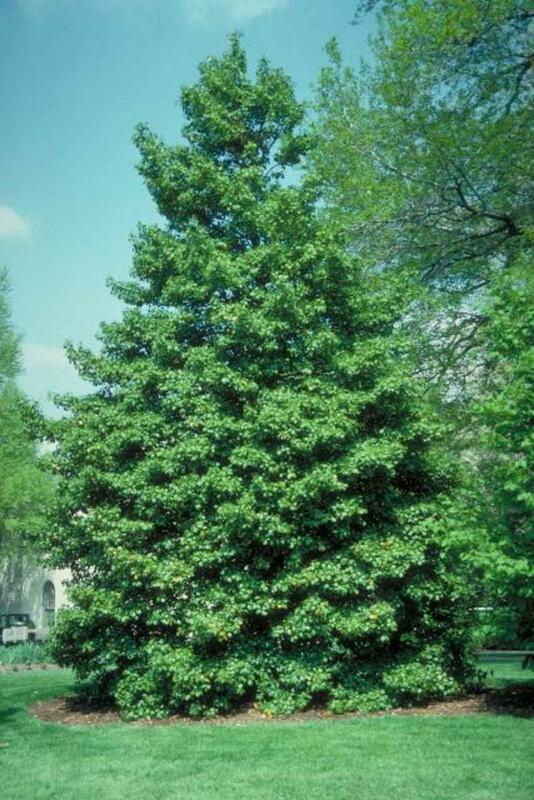 Nellie R. Stevens Holly maintains a natural pyramid shape and has a growth rate of 3 feet per year. It can grow up to a height of 25 feet. The leaves are a glossy, dark green with deeply serrated edges. 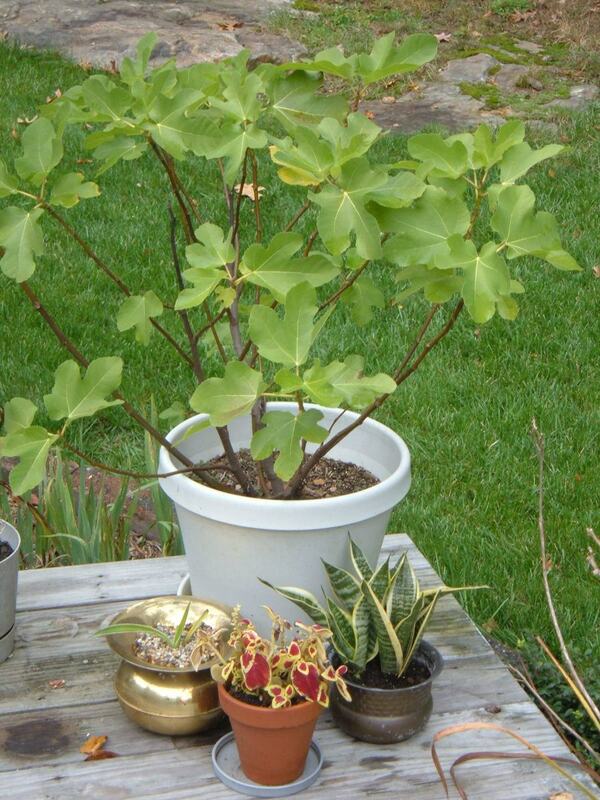 It grows well in full sun to partial shade with well-drained slightly acidic soil. The leaves of this tree do not change color during fall and remain green throughout the year. The flowers are small, white and bloom during spring. These trees have to be watered till they are well established, after that they become resistant to drought. Nellie R. Stevens Holly has to be planted with enough space to spread since the tree becomes wide at the base. The best time to prune the hedge is during early spring before new growth starts to show up. 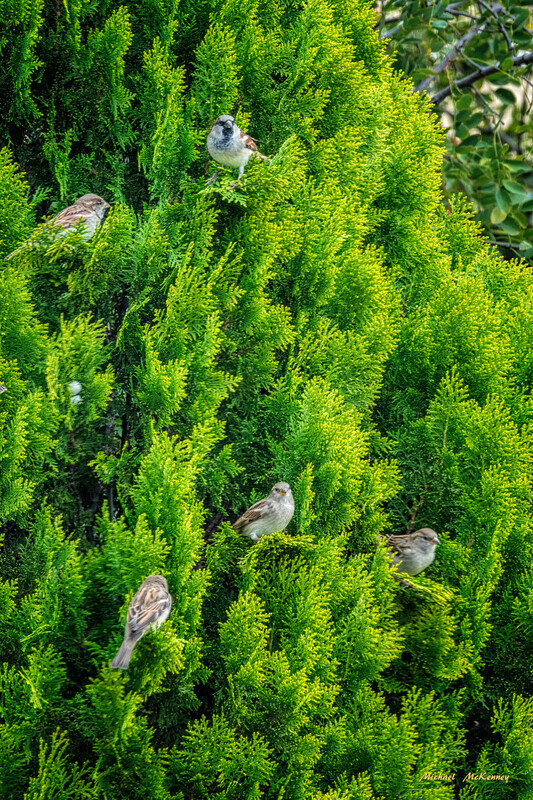 Plant these trees 8 – 10 feet apart to form a dense hedge. The best time to plant Nellie R. Stevens Holly is during spring so that it develop a good root system by winter. The Thuja Green Giant is a hybrid variety of Thuja standishii arborvitae and Thuja plicata. It has a growth rate of 2 - 3 feet per year. The Thuja Green Giant Arborvitae is a fast-growing evergreen tree. It is an excellent choice for a privacy screen. This tree can grow to a height of 50 – 60 feet and has a spread of 12 to 20 feet when mature. 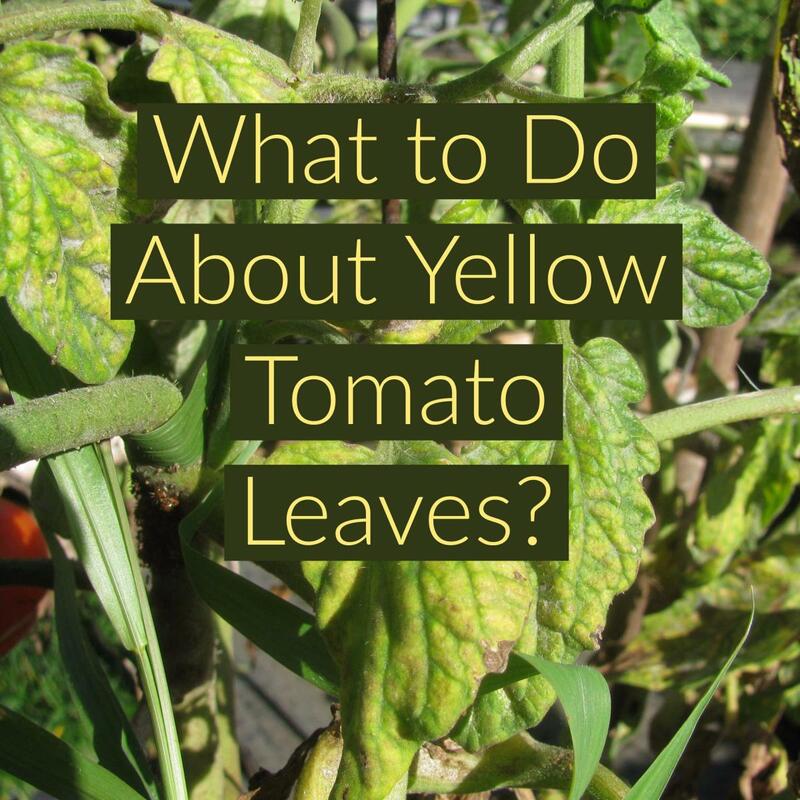 It can grow well in full sun to partial shade and flourishes in different types of soil but does not grow well in the poorly drained and waterlogged soil. The Thuja Green Giant has a natural pyramid or conical shape with dense foliage that is rich green. The leaves are tiny and tightly arranged in overlapping rows on branchlets that are further divided. 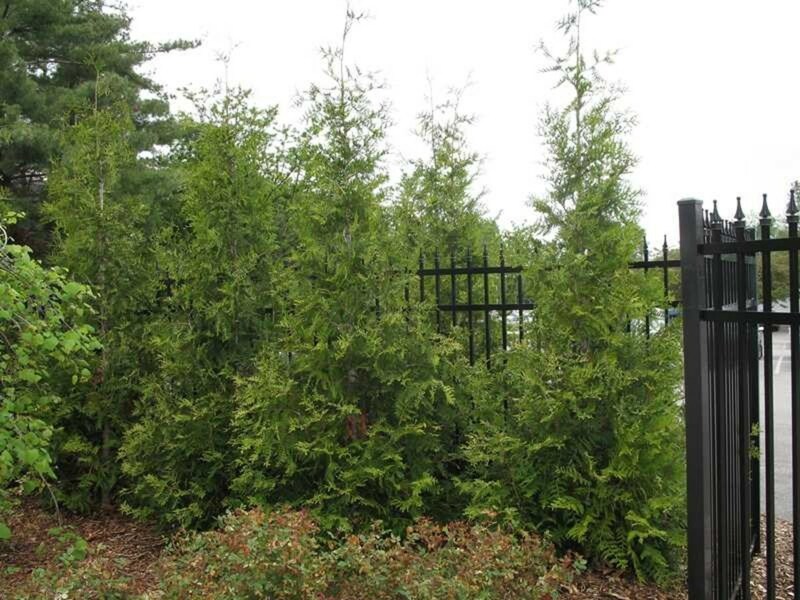 Plant the Thuja Green Giant Arborvitae about five feet apart to avoid overcrowding. The American Holly is an evergreen tree that can be trimmed to form a hedge or allowed to grow to form a thick privacy screen. The American Holly has a dense network of branches spread throughout the trunk. The leaves are broad, dark green and leathery in texture. 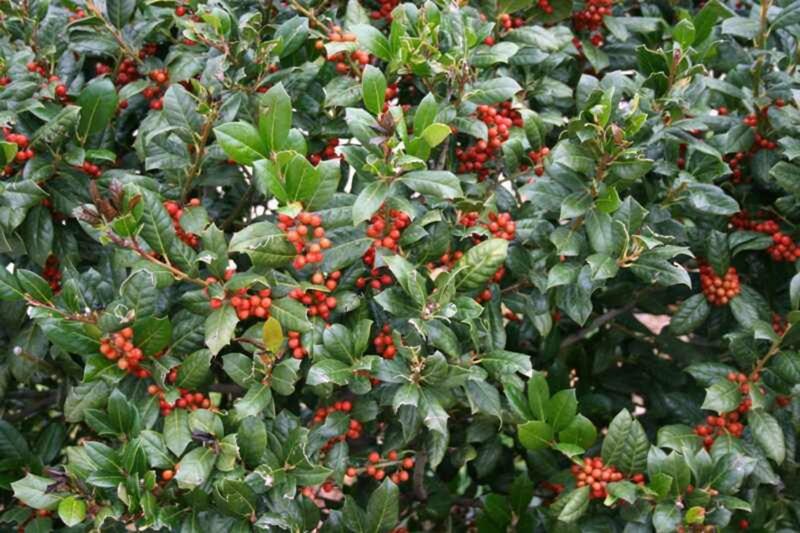 The American Holly grows well in full sun to partial shade and is well adapted to different types of well-drained soil. It grows up to a height of 20 – 30 feet and has a spread of 10 – 20 feet. This tree produces tiny flowers during April to early May. The flowers are cream or light green with a mild fragrance. It produces red fruits that add a pop of color to the hedge. Early summer is the best time to prune the American Holly so that the newly formed branches are not exposed to the cold. The Austrian Pine tree also known as the European Black Pine is an evergreen tree. This tree is an excellent choice for a privacy hedge in the cities. The Austrian Pines have dark green needles that occur in clusters of two per bundle. Each needle is are 3 - 8 inches long and can remain on the tree for about 4 – 8 years thereby forming a dense foliage. The young Austrian Pine trees are conical or pyramidal in shape, as the tree ages it develops a round, flattened top. 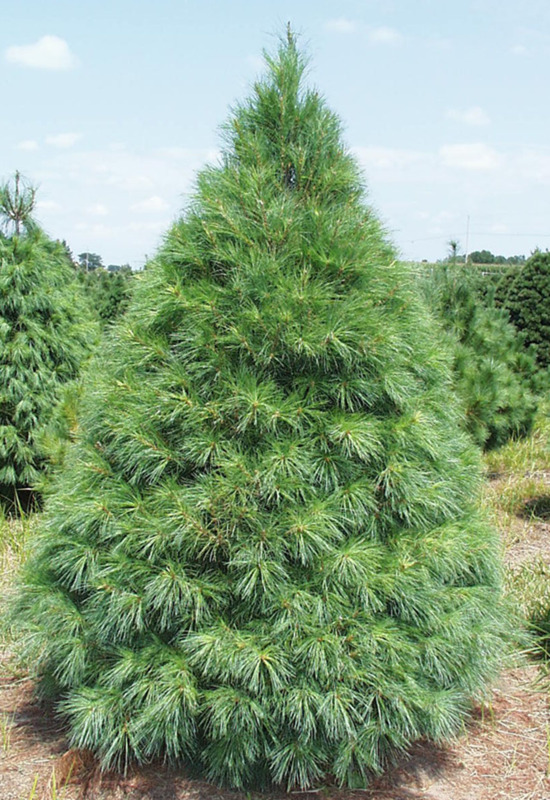 The Austrian Pine flourishes in full to partial sun with moist well-drained soil. They can also grow in a variety of soils conditions such as poorly drained clay soils and sandy soils that are moist and rich in salt content. Austrian Pines are drought tolerant and can flourish in areas where there are high levels of pollution and smog. 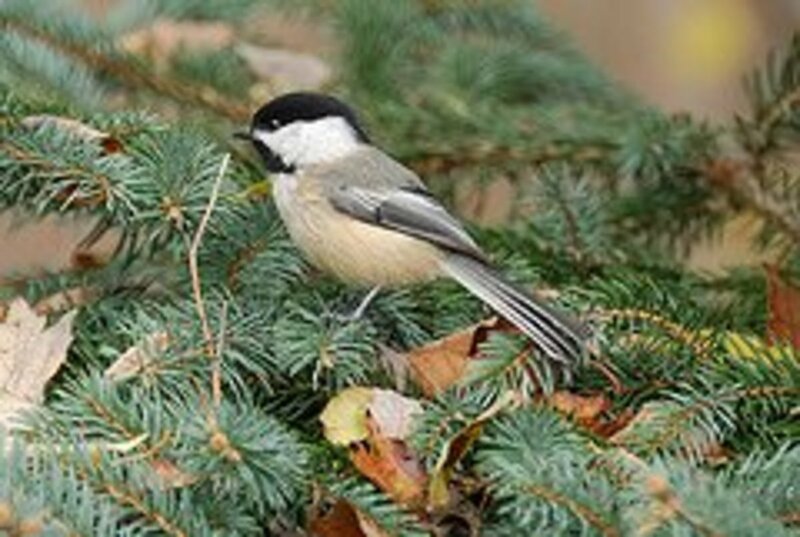 They can withstand harsh winters with heavy snowfall, and their branches can support the heavy weight of snow. This tree can grow up to 1 -2 feet per year. The best time to prune the Austrian Pine is during early June or July when new candle-like shoots appear. Plant the Austrian Pines with a spacing of 8 – 12 feet apart to prevent crowding. Thank you Jackie. Rosemary is an excellent choice. Love having hedges for privacy. I just learned a couple years ago that rosemary will grow into hedges and it is my dream now to have a long row of them. Just smelling them is supposed to be great for memory! Frances Metcalfe thank you, laurel hedges are great. Just looking to plant hedges at the moment as we have a larger border on our land, so a very apt article. Have started a laurel hedge as we have many young plants growing randomly, but the American pine sounds a contrasting alternative with its interesting berries. radhikasree thank you for the visit and comment. A great collection of hedge trees that resemble Christmas tree. Nice hub..
Peggy W thank you and am glad you found this hub interesting. It was interesting reading about these different types of hedge plants most of which were trees. The photos added much to this hub by way of actually getting to see what you were describing in words. Thanks! Thank you for this! I've been looking for something like this to put across my front yard to use as a privacy barrier. I am familiar with all the hedge plants you mention in here, except the Austrian Pine. It looks like a beautiful plant, but haven't seen them down here in SA. I wonder why not? Thanks, Vellur, for this informative and inspiring hub about hedge trees. FlourishAnyway these hedge trees are more beautiful than fences. The Leyland Cypress grows fast but these trees should be trimmed often so they do not bother the neighbors. Some of the people in my neighborhood development have opted for these instead of fences to demarcate their property lines and provide some privacy. I like them a lot better than fences! Mostly they use the Leyland Cypress; they sure do grow fast and tall. Have a happy holiday season. Nell Rose thank you and I agree with you the Austrian Pine is beautiful. AliciaC thank you. The Austrian Pine tree does look magnificent when compared to other trees. always exploring it must have been beautiful to have these trees around your home. Thank you for your visit. This is a very informative article. All the plants look interesting, but my favourite one is the Austrian Pine. I think it's an attractive tree. billybuc thank you. Wishing you the very best of good times in the holiday season and beyond. ChitrangadaSharan thank you. The hedge plants are fascinating and look great. A very well written and well researched article on Hedge plants. I am always fascinated by them when I see them along the roads or parks. But I didn't know so much about them. A very nice reference article for those looking for a hedge. Good research and nicely written. Wishing you the best in the holiday seasson.